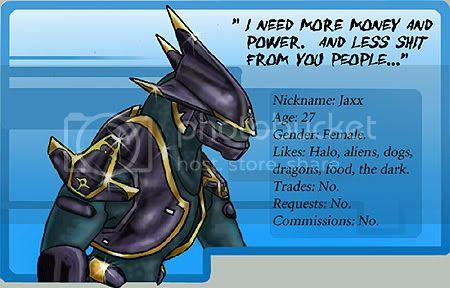 This is Jaxx's Public LJ. Meme's, and stuff pertaining directly to her website will be posted here. This is a replacement for her previous public journal. -Feel free to post or comment on whatever. -Do feel free to POLITELY voice an opinion. -Bring up orginized religion, or anything in a religious context. I'm Agnostic and don't appreciate it. Keep it to yourself. -Don't disrespect anyone. Or I'll eat your face.